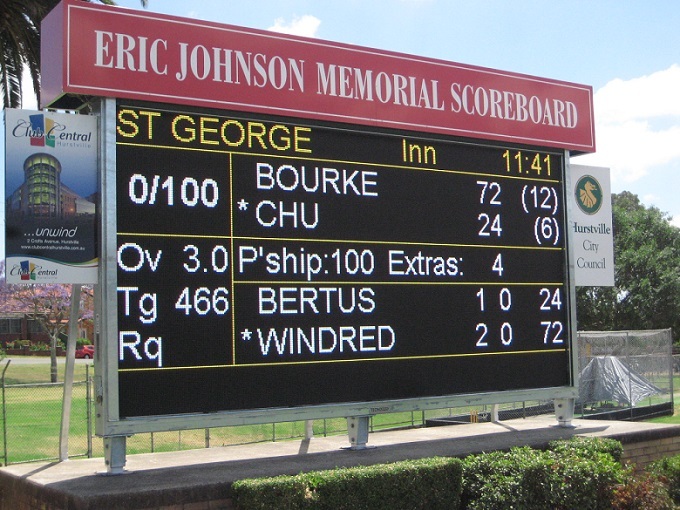 The scoring software used by St George Cricket Club in Hurstville NSW is Total Cricket Scorer from the UK. 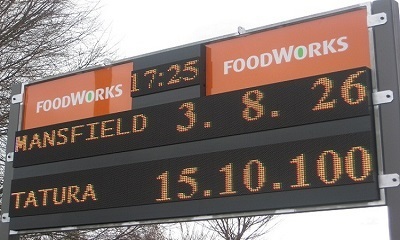 Tecnovision created the XML reading software to enable the display of Game Data on the large Video Screen / Scoreboard. Over 650 items of Game Data are available for use and display. 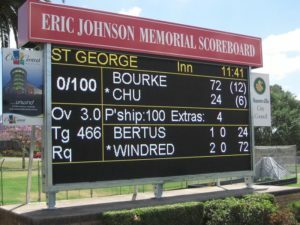 Tecnovision Australia has interfaced both Total Cricket from the UK and Statsmaster/My Cricket from Cricket Australia to show the data from these scoring systems displayed on electronic scoreboards. 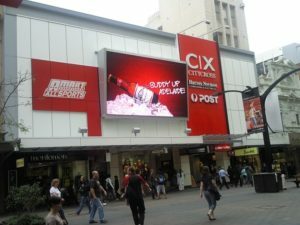 The large Advertising Screen in Rundle Mall, Adelaide is a Virtual 10mm Pitch Screen. This is old technology now but it works and presents brilliantly. 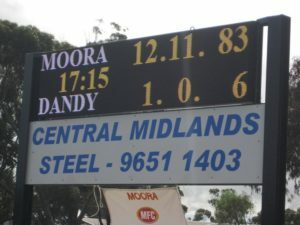 The data and advertisements are sent from Melbourne, by Internet to the screen, and the on board player/computer displays the advert at the agreed time. It also sends back to Melbourne, confirmation that the particular advertisement was in fact aired at the agreed time. Software was devleoped by Tecnovision. 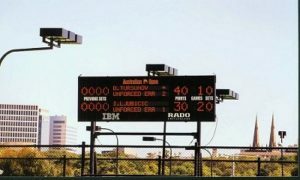 Tecnovision developed this simple scoring software and it comes as a free add-on when purchasing a Tecnovision scoreboard. The clock counts up or down depending on club preference. 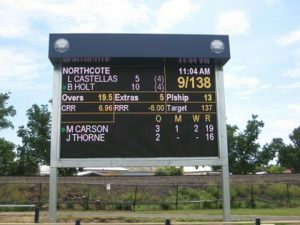 Tecnovision developed this DOS based cricket scoring program some years ago and it was used in Geelong, Bellerive, and the West Indies. It is no longer available due to the platform it was written on but it did put Tecnovision ahead of many other scoring program developers. This scoreboard at Shepley Oval in Dandenong is displaying data from the Tecnovision ‘simple’ and ‘free with the scoreboard’ range of software solutions. This is a small charge for sizing the output to the specific screen size. This was very ‘ahead of it’s time’ software for the Australian Open scoreboards. In 1998 software was developed in Ireland which presented these scoreboards on Television with absolutely no interference with the scan rate of the TV Cameras. 29 of these scoreboards were delivered over 4 years. This AFL scoreboard at Victoria Park in Richmond is 16 Mtrs wide and 560mm high. The scoring system had to be wireless and was written by Tecnovision as a ‘one off’ project. 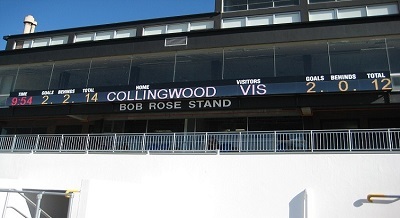 This was the historic first home of the Collingwood Football Club. In Moora, 3 hrs drive north of Perth, Tecnovision has this magnificent scoreboard. 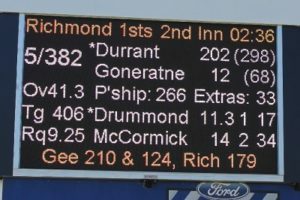 This is another example of “free with the scoreboard” software developed by Tecnovision Australia.